One hundred years ago today, radical sailors, soldiers, and workers in Germany rose up to put an end to the carnage of World War I. And the revolutionary upheaval had only just begun. Armed revolutionary soldiers, sailors, and civilians are photographed on November 8, 1918 in Berlin, Germany. On November 9, 1918, two different republics were declared on the squares of Berlin. One declaration aimed to usher in socialist revolution in the heart of capitalist Europe. The other sought to forestall events and contain the social explosion. The German Revolution had many sources: the world-shattering transformations brought on by the Great War, the legacy of strong socialist organization among German workers, and the drastic expansion of political horizons announced by the Bolshevik Revolution in Russia. Besides the particular names, faces, events, and features of the era, the revolution was, at bottom, driven by the conditions of industrialized capitalism and the contours of collective action inherent in a class society. It was the German working class, building on the achievements of its Russian counterparts, that traveled the furthest along the road of socialist transformation, coming closer to full-fledged workers’ power than any other industrialized Western country in the postwar revolutionary wave. Ever since, the dynamics that played out over five years of revolution in Germany have been a key, indeed irreplaceable, reference point for socialists the world over. The fall of the kaiser opened up a field of possibility, in which a number of forces would contend to shape Germany’s future. It started in Kiel, a port city in the North. Ordered out to their deaths for the glory of the kaiser, the war-weary sailors refused to obey. On ship after ship, commanding officers were stripped of their authority, and red flags ran up the masts. Word of the sailors’ revolt quickly spread to the other port cities. Within hours it was Wilhelmshaven, then Bremen, where the factory workers seized control. Like a red dye bleeding southward through the fabric of industrial Germany, the workers’ and soldiers’ councils expanded their authority all along the western front — from Münster to the mines of the Ruhr, then to Cologne, and Frankfurt. The wheels of revolution turned faster with every city it liberated — Freiburg, Stuttgart, Munich. Within three days, half of Germany had climbed out from under the muck of ages. All eyes now turned to the capital. Berlin had become a fortified camp: the military occupied all of the large firms, officer patrols crawled the streets, and all public buildings were guarded like fortresses. Rail links were cut off in an attempt to isolate Berlin from the revolutionary provinces. Everything had been prepared for a great battle with the workers of the capital. Yet the imperial authorities were in for a surprise. On the morning of November 9th they churned out following the calls of their leaders, the immense working masses came from the outskirts, from the factories where they had gathered, toward the interior of the city. Armed troops marched at the head of the mass. New troops continuously joined them. From the small businesses, from the houses now flowed a never-ending stream of them, adding to their number. The whole of proletarian Berlin, the grey impoverished mass that had starved and bled for four years, rose up. And before their daunting presence, any thoughts of resistance and battle melted away. The militarized police, who were used to beating only the unarmed, dropped their weapons as soon as they saw the glint of rifles at the front of the worker columns. The barracks opened up as the workers passed by, and the soldiers either joined them or declared themselves neutral. In a few hours it had become clear that reaction no longer had any power to employ, and the government was compelled to issue the order: all armed clashes were to be avoided — it had surrendered. By midday Berlin was in the hands of the revolutionary workers and soldiers. 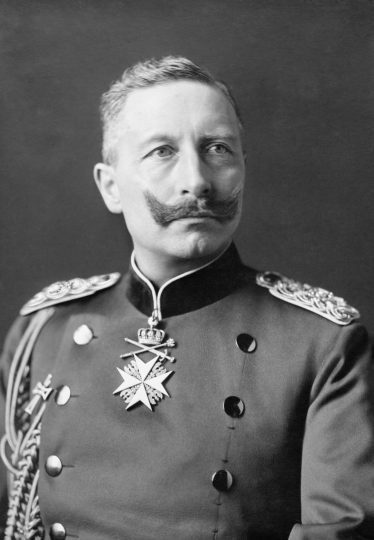 The kaiser’s Germany was a daunting regime. Not only did a landowner-officer class, the Junkers, utterly dominate the imperial bureaucracy and military, the interventionist state came to underwrite the expansion of capital in Germany, in addition to the provision of technical and scientific education, transportation infrastructure, and the palliative of social welfare, introduced by Otto von Bismarck. As the Social Democratic Party of Germany (SPD) grew in size and power at the turn of the twentieth century, large German employers saw little to gain from democratic reform of the state. Much in line with their US counterparts, German industrialists adopted repressive and paternalist relations with their expansive workforces in order to combat trade unionism. On the eve of the war, Germany was the second largest coal-producer in the world, and the largest producer in Europe of iron, chemicals, and electrical appliances. German capitalism was a behemoth, and the would-be organizers of its overthrow were forged at its heart. As in Russia, Italy, and Britain, this above all meant the metalworkers, organized in the mighty German Metalworkers’ Association (DMV). Their importance only grew as the war ground on, transforming the German economy in ways that increased and concentrated their number. With the war came hunger, repression, the separation of loved ones, death, and, over time, anger. Strikes steadily increased in the latter part of the war, with the number of workdays lost rising from a quarter million in 1916 to 1.86 million in 1917, and then leaping to 3.25 million in 1918 before the outbreak of revolution. These actions peaked with mass political strikes, first in June 1916 to protest the arrest of SPD militant Karl Liebknecht, then a “bread strike” in April 1917, and finally a massive, workers’ council–led strike in January 1918 against the war and the repressive state. Women played a leading role in the wartime labor upsurge, constituting 62 percent of all strikers in 1916 and 75 percent the following year. 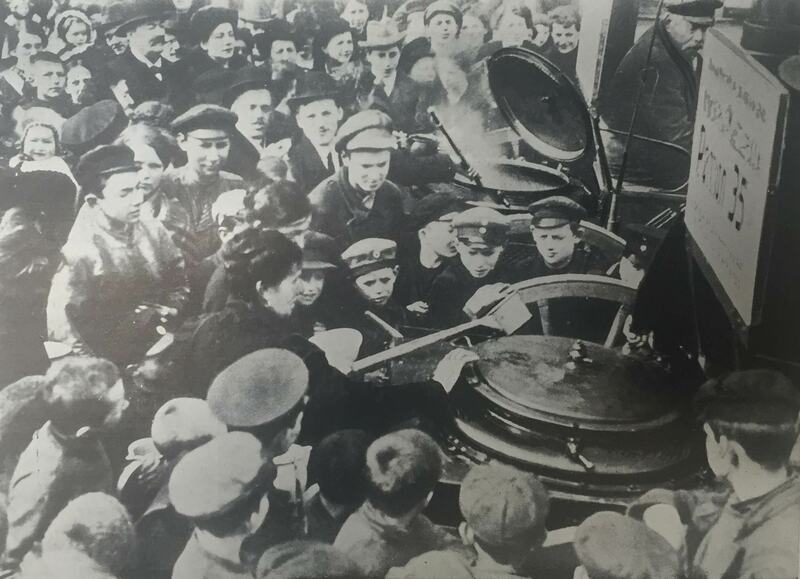 The wartime political strikes, and the November Revolution itself, were chiefly organized by an underground militant network of trade union activists in the metalworking industries: the Revolutionary Shop Stewards. Secretly formed in May 1916, the Revolutionary Shop Stewards were a “militant minority” of trusted and well-placed shop stewards in the large factories organized by the German Metalworkers Union. As the work of historian Ralf Hoffrogge has brought to light, their entire network consisted of about one thousand people, but they were able to mobilize hundreds of thousands during the wartime strikes and demonstrations. The shop stewards were used to day-to-day union struggles, and were resistant to taking action beyond what they, perhaps rather statically, considered the will of the majority of the working class at any given moment. The Revolutionary Shop Stewards were members of the Independent Social Democratic Party of Germany (USPD), the main rival to the SPD, from which it had split in 1917 on antiwar grounds. In 1914, the SPD had committed to cooperation with the kaiser’s state, disciplining the labor movement in support of the war effort — a shocking betrayal in the eyes of radicals internationally. The specter of Bolshevism had cast a long shadow over Central Europe. The sheer fact of a triumphant workers’ and peasants’ revolution in the East, and the consequent Russian withdrawal from the war, had animated the minds of German workers and soldiers alike. After the February Revolution in Russia and intensified strike activity in Germany, a split ripped the party top to bottom. The resulting USPD was, aside from its pacifism, politically ambiguous, and encompassed stances that ranged from the reformism inspired by Eduard Bernstein to forces who advocated the dictatorship of the proletariat. This ideological ambiguity was initially a major advantage for the USPD. It allowed it to function as the receptacle for the early spirit of the revolution. Over subsequent weeks and months, however, the rapidly unfolding situation posed questions that demanded clear political answers. Constrained by conservative leaders, the left wing of the USPD eventually faced a choice between ceding its ability to take action in an organized way and splitting from the party to free its hands. But these divides had not yet been forced to the surface. For now, the Revolutionary Shop Stewards saw themselves primarily as militant trade unionists and made their decisions separate from party decision-making bodies. They were an influential trend, but not the only disciplined network within the USPD to foment the revolution. Led by the brilliant and thunderous Luxemburg and the wildly popular Liebknecht, this group distinguished itself by lambasting the Social Democratic party leadership that had supported the Great War and providing an analysis of where social democracy had gone catastrophically off course. The core of their message during the war was to recast the role of the masses of workers in socialist theory and politics. 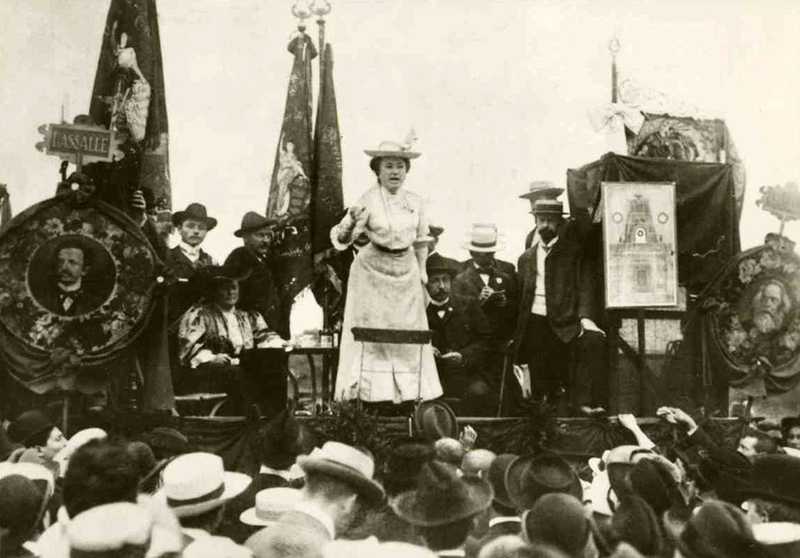 Rosa Luxemburg addresses a crowd in 1907. For the SPD, these masses of ordinary workers were to serve as props, the passive audience of parliamentary politics, vote collectors who could occasionally approve or, more rarely, disapprove of what elected leaders did. By contrast, the Spartacus group focused on workers’ self-reliant collective action, such as mass strikes. As they stressed repeatedly in their letters: “for the proletariat there exists only one savior: the proletariat itself.” Their emphasis on street demonstrations and quickness to call for radical action often brought them into conflict with the Revolutionary Shop Stewards in the early phase of the revolution. At the time of the revolution, the Spartacus group consisted of one to two thousand people, a network of working-class activists, youth leaders, and intellectuals also operating within the USPD. Despite their small size, whole layers of active USPD members, including the Revolutionary Shop Stewards, relied upon their analyses of the developing situation, even if they did not always share their strategic conclusions. 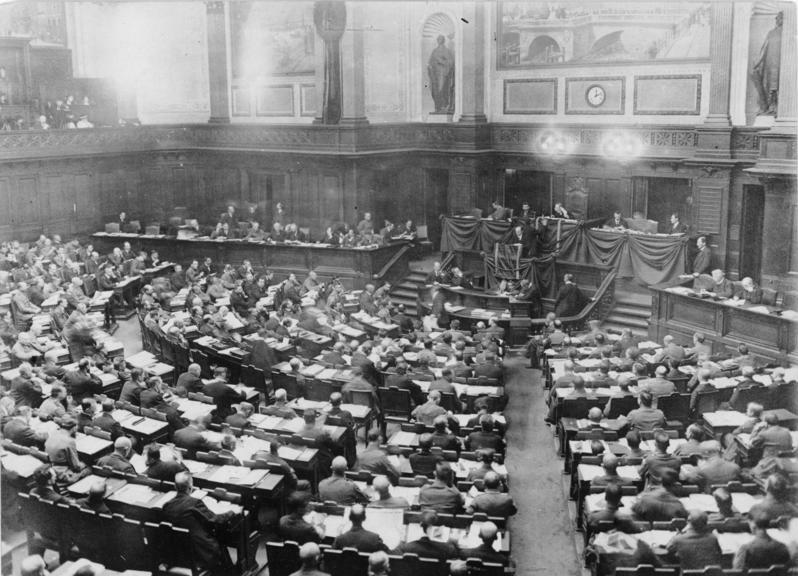 With the monarchy overthrown, two paths remained open for the revolution: either, as the SPD planned, parliament would become the highest power in the land through the calling of the National Assembly, or else a new socialist order could be built based on the power of the workers’ and soldiers’ councils. These councils had arisen in factories and barracks to organize the uprising, and remained the institutional embodiment of the revolutionary wave. Inspired by the Russian example, these councils were radically democratic organs in which the workers and soldiers could exercise direct control over their workplaces and cities. In every case they were improvised. In the cities of Bremen, Chemnitz, Hamburg, and Leipzig, where revolutionaries in the USPD predominated, the workers’ and soldiers’ councils dismantled the machinery of the old capitalist government, dissolving legislative bodies and old city councils. The police force was dissolved and replaced by Red Guards or militias under council control in these cities, as well as in Frankfurt, Halle, and in the capital. In Brunswick the workers’ councils set about expropriating some factories. In uneven fashion, across Germany the councils organized to prevent troop movements, seized counterrevolutionary newspapers, and coordinated strikes. Their challenge for political power was real, but it was also severely crippled from the outset. The councils of Berlin first met on the second day of the revolution. Three thousand elected council delegates from factories and barracks across the city assembled in a massive arena called the Busch Circus. This assembly would act for all councils across the country, and its composition was therefore hotly contested. In addition to a slew of tricks and maneuvers to ensure their influence, SPD organizers were aided by the fact that the assembly fell on a Sunday, when workers could not be easily called to vote in their workplaces on the choice of council delegates. Soldiers, who constituted a majority at the November 10 assembly, were generally more loyal to the SPD and more easily found in their barracks. The raucous meeting teemed with passion and claims of betrayal, oscillated between high drama and parliamentary humdrum. Amid endless calls for “unity” by both SPD representatives and the vast majority of worker and soldier delegates, Karl Liebknecht took the floor to call for vigilance against the SPD’s machinations. I am afraid that I must try to pour cold water on your enthusiasm. The counterrevolution is already on the march; it is already in action! (Shouts: Where is that?) It is already among us. . . . Danger threatens not only from those circles that up to now have held the reins — the demagogues, big landowners, Junkers, capitalists, imperialists, monarchists, princes, and generals — but also from those who today support the revolution, but were still opposing it the day before yesterday. (Stormy interruptions: “Unity, unity!” Retorts: “No! Shouts: “Sit down!”). In the end, a ubiquitous and deep-felt desire for working-class unity allowed the SPD to carry the meeting with their proposals. From this first council assembly, a provisional body called the People’s Commissars was elected to carry out the practical administration of the revolutionary government. Days later, under mass pressure from below, this body decreed universal suffrage for women, a key demand of the revolution and one of its lasting legacies. The People’s Commissars consisted of three members of the SPD and three of the USPD. Its political course, however, was chiefly determined by the leading member of the SPD, Friedrich Ebert. Although the People’s Commissars were technically subordinate to the revolutionary councils, and the USPD had members on both sides, in practice the two bodies contended for power throughout the final months of 1918. The SPD leadership took its place in the new provisional government of People’s Commissars with a clear-cut program: maintain the unity of the Reich, keep the state machine functioning, prevent the collapse of the economy, and counteract a chaotic course of development. The SPD was one of the first Second International parties in an industrialized capitalist country to realize the old social-democratic aim of taking over the government. They would pioneer a new style of social democracy in power. Determined to prove themselves responsible custodians of the existing order, in 1918 the SPD leaders took stabilization and the return to a semblance of the status quo ante as their guiding ethos. The first move was to transfer authority from the chaotically democratic councils to the parliamentary National Assembly. For both the parties of industry and the SPD leadership, the council system was a path to “Russian chaos.” The dire food shortage in Germany was certainly cause for alarm — by January 1919, eight hundred Germans a day were dying of hunger. Yet the partisan new government under Ebert rejected ready shipments of grain from revolutionary Russia in favor of promises of food from President Wilson in the United States, but not before Ebert himself added the condition that order be reestablished in Germany. The politics of order were not the sole province of the SPD leaders, however, and nor were the parties and councils the only vehicles of radical activity. Membership in the socialist unions, known as “Free Trade Unions,” skyrocketed in the wake of the revolution, doubling from 1.4 million to 2.8 million in its first two months, before hitting 4.7 million by March 1919. Membership continued to surge over the following tumultuous years, peaking at 8.1 million in the second quarter of 1920; 54.7 percent of the entire workforce were organized in a single union federation. 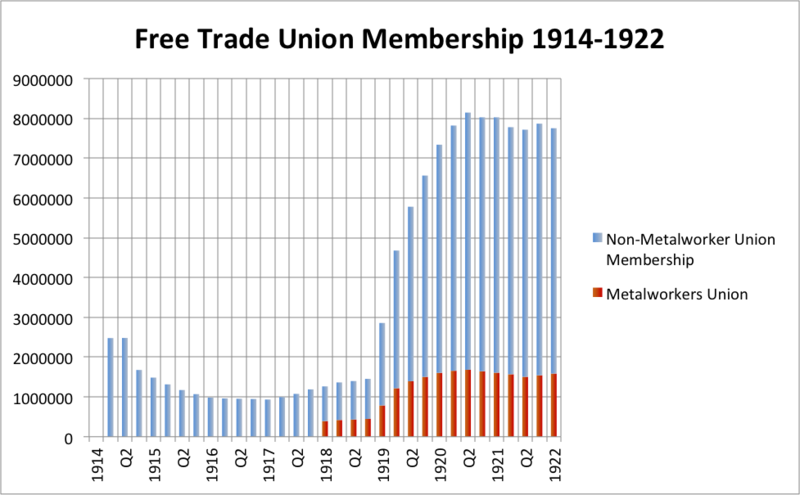 Union density in the decisive metalworking industry peaked at over 91 percent in 1920. Political ideas careened to the left as the revolution reached lightning-like into the minds of the workers. 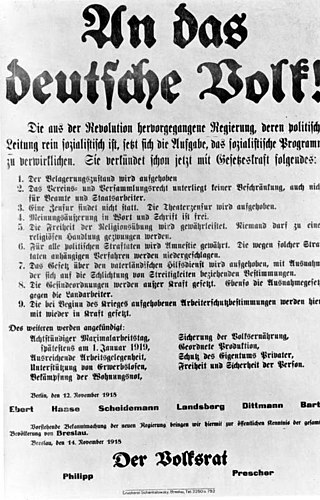 Textile factory workers in Württemberg were reportedly denouncing their non-unionized workmates as class traitors almost before the ink on their own union cards was dry. While the state was in collapse and the parties contested for power within the councils, another order was quietly being created. Already on the ninth, the leader of the Free Trade Unions, Carl Legien, negotiated an institutional alliance with the representatives of heavy industry. Freewheeling discussion of wholesale expropriation in the councils was enough to motivate the employers, but the union officials sought to use the alliance as a deterrent against the internal union opposition and encroachments by the council movement on the field of economic control. The historian Susanne Miller has pointed out that these decisive measures at the crucial hour made the social-democratic trade unions the “strongest factor of stabilization in the transitional economy.” Before the future state system was even decided, capital was therefore able to secure and enlarge its sphere of influence. Except for the imposition of the eight-hour day, which would prove temporary, capital escaped the fiery weeks of revolution largely unscathed. Neither the new government nor the councils were able to encroach on private ownership, and German capital retained all of its strongholds. A key demand of the revolution had been for measures to nationalize key industries, such as mining. Although a formal committee was set up to do this in mid-November, it was comprised of representatives of the trade unions, the employers themselves, and economists — ensuring its paralysis. The People’s Commissars were effectively asking the employers to expropriate themselves. Two of the three USPD People’s Commissars shared a perspective with the SPD and union leaders: first economic collapse had to be avoided, and only then could any nationalizations (termed “socialization”) take place. The nationwide First Congress of the Workers’ and Soldiers’ Councils was convened on December 16 to decide on the future of the revolution and the fate of council power. Hundreds of thousands of workers marched outside in an anti-government demonstration led by the Spartacus group, as Müller and another leading member of the Revolutionary Shop Stewards, Ernst Däumig, made the case for a council republic, in opposition to SPD plans for the cross-class National Assembly. Days after, Ebert’s government attempted to consolidate power by forcefully evicting a bastion of revolutionary sailors from the palace stables. In response, the sailors arrested the acting military commander of the city of Berlin, the Social Democrat Otto Wels, on the authority vested in them by the revolution. Any doubt about the loyalties of the SPD leadership were shattered when Ebert called on the German army High Command to break the resistance of some of the same sailors who had sparked the revolution with their mutiny in Kiel. As Berlin workers awoke on Christmas morning to the sound of German army shells, they once more took to arms — this time, against a military under the authority of the SPD. Masses of armed workers and Emil Eichhorn’s radical city militia mobilized to aid the revolutionary sailors. The multitude approached, rushed, and flung themselves onto the barriers of the soldiers attacking the sailors. Shamed and indecisive, the soldiers were overrun in seconds. For the first time, the Social Democrats’ commitment to the old state and its order had required them to shoot down revolutionary workers. For the first time, the Social Democrats’ commitment to the old state and its order had required them to shoot down revolutionary workers. It would not be the last time. For many, these experiences pierced through the long-cultivated image of the SPD leaders as champions of the common worker. The provocation of the government had left rank-and-file workers in the capital incensed and radicalized. The revolution, far from over, was alive and fighting. In the following days, the USPD ministers of the People’s Commissars refused to take responsibility for the order to attack the sailors and resigned from their government posts on December 29. On New Year’s Eve and New Year’s Day, the Spartacus League came together with radicals from Bremen to create the Communist Party of Germany, or KPD. 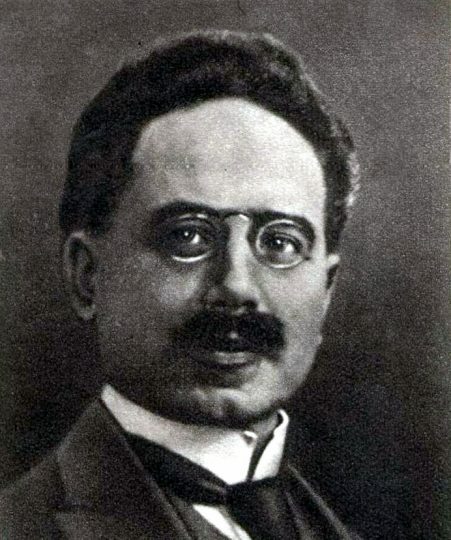 Initially, Karl Liebknecht was in negotiations with the Revolutionary Shop Stewards to join the fledgling party. Although cautious, the stewards were by then more convinced that they could benefit from the Spartacus leaders’ clear political analysis and popular support, and the Spartacus group needed the Stewards’ roots in the working class. Luxemburg and Liebknecht were unable to win over the new party’s rank and file, and the talks foundered when ultra-radical elements in the KPD refused to work meaningfully toward mass influence, taking positions disdainful of the broader workers’ movement. Because of this, the newborn KPD was deprived of the militant minority of the German working class. The mistake would haunt the party for the next two years of the revolution, and lead to catastrophic consequences. Mere days after the founding of this party, the SPD government’s attempt to remove the popular left USPD member Eichhorn from his office as chief of police provoked a coalition of the RSS, the KPD, and the USPD to issue a joint call for a mass demonstration. The response was unexpected: two hundred thousand armed, militant, and determined workers marching to defend the revolution. This was an entirely new situation — a mass of armed workers ready to take action, even against a Social Democratic government. 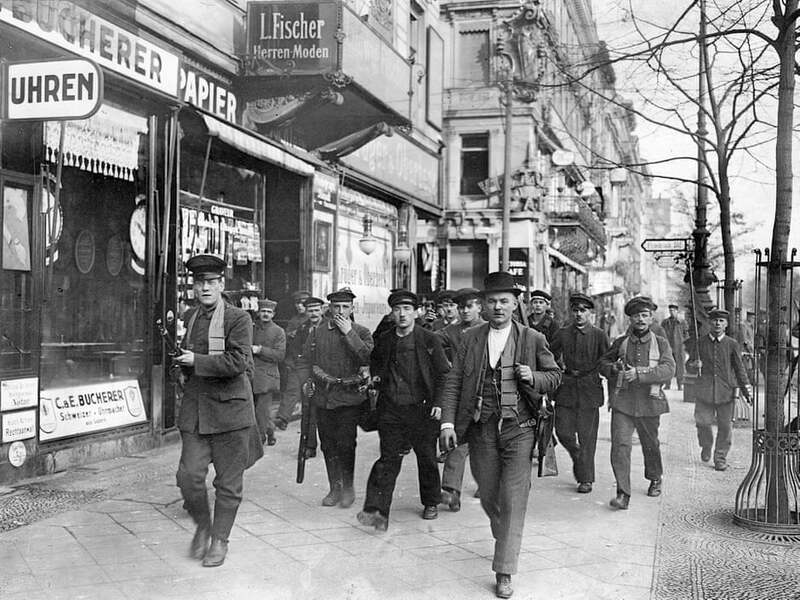 Several detachments occupied the offices of the SPD newspaper, Vorwärts, and when Ebert and Scheidemann announced their plans to forcibly reinstate order, the shop stewards and Karl Liebknecht decided they had no choice but to call a general strike, “for the final fight.” Armed confrontations broke out in the newspaper district on January 8, but they remained without unity among the leading revolutionaries and without a decisive action plan for the city and the country. The opportunity was seized by the new SPD war minister, Gustav Noske. In the radicalized atmosphere on the home front, the soldiers of the military had become largely unreliable to shoot on their fellow workers and soldiers. Instead, a volunteer army, fueled by reactionary misogyny, called the Freikorps (“free corps”) was assembled to combat revolutionary activity. It was first deployed against the Bolsheviks in the Baltic, and then set against worker unrest at home. 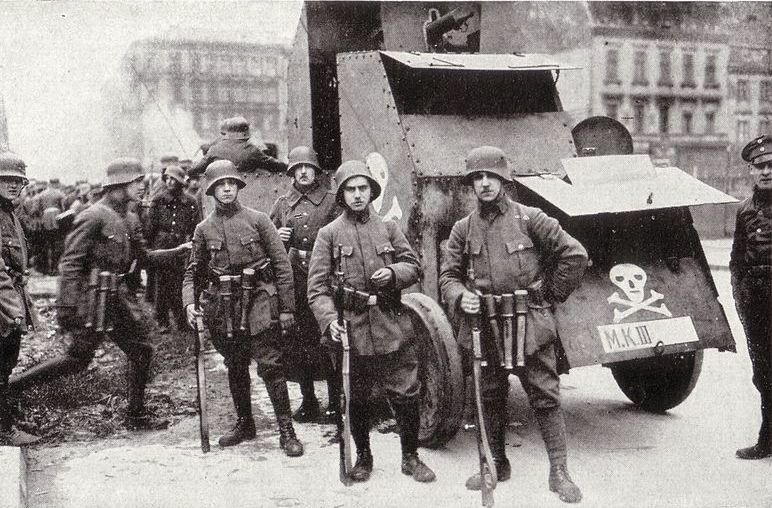 Upon joining, Freikorps members took a special oath of loyalty “to the provisional government of Chancellor Ebert.” Using these shock troops and the loyal remnants of the army, Noske unleashed a bloody civil war against the Left, especially the Spartacus group. On the 9th of March Noske ordered the Reichswehr to shoot on the spot anything that moved. Then the butchers set about their work. While the facades of houses collapsed under the fire of machine guns and mortars and whole families were buried under the rubble, the proletarians were herded with live fire and bayonets into the schoolyards and stables. Alone, by twos, by threes, in groups: against the wall and shot. At night on the river Spree, the revolvers touched workers’ temples and shot. For weeks the Spree washed up corpses onto the shore. Again and again: “A Spartacist nest has been dug up” and eight human beings shot, thirty shot, thirty four shot, and so it went hour by hour, day and night. Over the next five years, the most powerful workers’ movement in the world outside of Russia would more than once topple the German government and plunge the entire German economy into the abyss. The German Revolution had only just begun. Sean Larson is PhD student in German studies at New York University.